Although many of the figures were already known on earlier cards, the Paris pattern was established as such around the middle of the seventeenth century (based, perhaps, on the cards of Hector of Troyes). 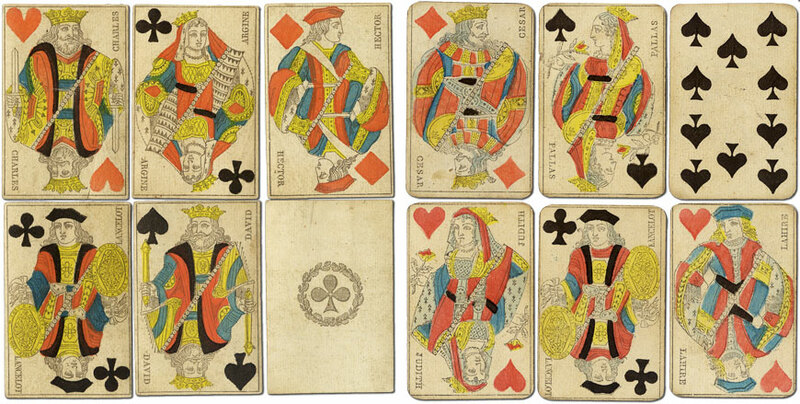 The cards had single-figure courts until around 1830 when the double-ended version came into use. The court cards are usually named, and the exact reason for, or origins of, these names is still open to debate but they seem to derive from epic narratives from the age of chivalry or heroes of antiquity. The court card designs also appear in the cards of other parts of Europe as provincial variants (e.g. Belgian 'Genoese' pattern, Italian 'Piedmont' pattern). See also: similar decks manufactured in Germany by Johann Forster Johann Backofen Joseph Losch. In the middle of the eighteenth century legislation was introduced making the Paris pattern the official portrait or pattern for the whole of northern France. 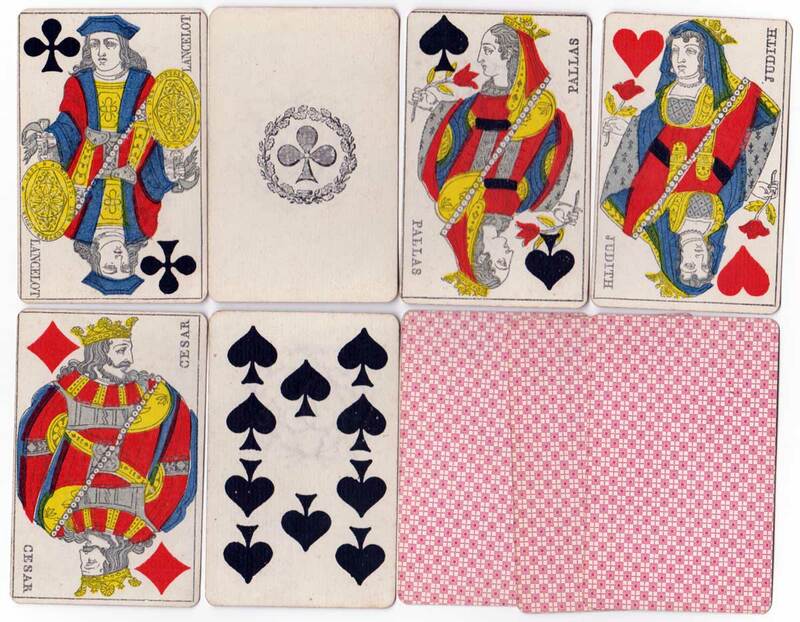 Above: cards from full-length version of the Paris pattern, anonymous manufacturer, c.1810. In the double-ended versions, although more convenient, many charming features of the designs are lost. Above: two examples of standard double-ended Paris pattern playing cards, made by B. P. Grimaud, c.1855-75. Both sets are stencil-coloured. 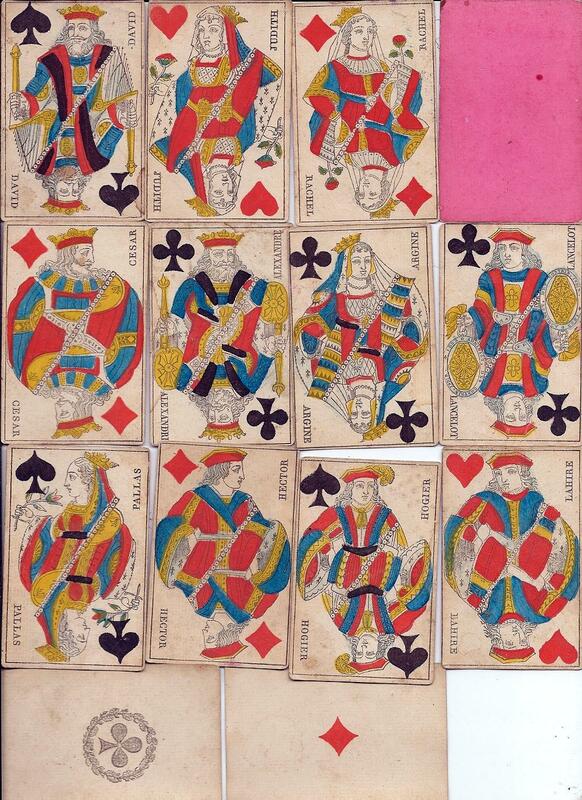 The left-hand set is from a 32-card deck and has square corners. The right-hand cards are from a 52-card deck, with rounded corners. There is an imperial eagle watermark on the right-hand cards.